Figure 1. Multiple device trees overlay in bootloader. Note: Using multiple DTs is not mandatory. To add support for multiple DTs to the DTO model, set up a list of main DTs and another list of overlay DTs. Figure 2. Runtime DTO implementation for multiple DTs. Read the board ID and select the set of overlay device trees accordingly. Only one main DT should be selected for use at runtime. Multiple overlay DTs may be selected but they must be compatible with the chosen main DT. Using multiple overlays can help avoid storing one overlay per board within the DTBO partition and enable the bootloader to determine the subset of required overlays based on the board ID (or possibly by probing the peripherals). For example, Board A may need the devices added by the overlays 1, 3, and 5 while Board B may need the devices added by the overlays 1, 4, and 5. To partition, determine a bootloader runtime-accessible and trusted location in flash memory to store the DTBs and DTBOs (bootloader must be able to locate these files in the matching process). Keep in mind that DTBs and DTBOs can not exist in the same partition. If your DTBs/DTBOs are in the dtb/dtbo partition, use the table structure and header format detailed in DTB/DTBO Partition Format. 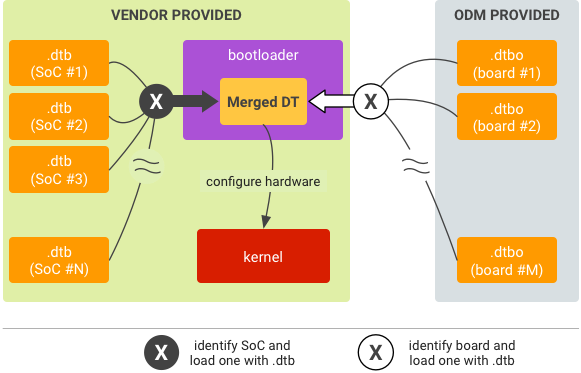 Identify the SoC and load the corresponding .dtb from storage into memory. Identify the board and load the corresponding .dtbo from storage into memory. Overlay the .dtb with the .dtbo to be a merged DT. 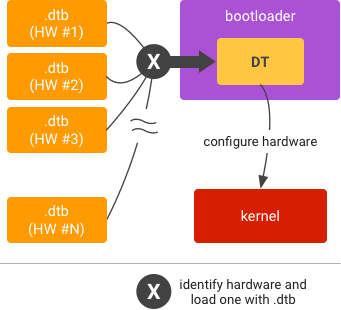 Start kernel given the memory address of the merged DT.